Never has there been such a profound incomprehension between an acclaimed, even celebrated writer and his readers, as when Gustave Flaubert finally presented the last version of his masterwork, “The Temptation of Saint Anthony” to his Parisian audience. It was as if Flaubert, the “Hermit of Le Croizet”, like the famous fourth century anchorite he had so genially brought to live, had toiled and suffered too long in solitude over the conception of his book. So much so, that his friends and admirers did not recognize him when he reappeared on the literary scene with the publication of his new book. The giant creative step that Flaubert took in “The Temptation”, away from that realistic style that had made him famous, was perceived as a titubation, a stumbling of the “Old Master” and the critics, ever on the look for a scandal, smelled blood and went for the kill. The bad reception of the book was general and it was immediately and viciously hacked to pieces. Commentators found the ideas behind the book too confused, arcane, and even obscure. Flaubert was accused to be a “show-off”, his book a revolting failure. Others spoke of its content as a « Bric-à-brac », a bizarre silliness, a caricature of history, a falsification of poetry. Worst of all was Barbey d’Aurevilly, who had earlier acclaimed “La Bovary” and its writer, who now spoke of “La Tentation” as incomprehensible, its intentions undecipherable and, adding insult to injury, found it of an « overwhelming boredom, a boredom which is not French, a German boredom, the boredom of the second Faust of Goethe» (un ennui implacable, un ennui qui n’est pas Français, un ennui Allemand, l’ennui du second Faust de Goethe…). This public flogging came totally unexpected to Flaubert and, in panic, devastated and bewildered he called in the help of his friends. Neither Ernest Renan nor the Master of Masters, Victor Hugo himself, could turn the tide and the book, after being ripped apart in that initial sanguine frenzy, was soon dumped and discarded. But it could not be forgotten. Written in the form of a play script, Flaubert’s “Temptation” describes one turbulent night in the life of the 4th century anchorite Anthony the Great better known as Saint Anthony (c. 251–356). Anthony has withdrawn from secular society and lives alone in the Desert Mountains of the Egyptian Thebaid. He survives on coarse bread and water, shelters in a primitive hut, spent his days in contemplative prayer to his one and only Christian God. Real and mythical details of the life of the real Anthony the Great, the celebrated Christian Saint, are known thanks to the hagiography written by his contemporary Athanasius of Alexandria. The life, ordeals and temptations of Saint Anthony, who was the first ascetic going into the wilderness, were a major source of inspiration for many artists since the Middle-ages, because it allowed them to unleash their creative fantasy and transgress the borders of the accepted religious topics. From Hieronymus Bosch, through Grunewald and Schöngauer, until the drumstick-legged Elephants of Salvador Dali, Antony has been depicted battling off armies of horrors and resisting timeless temptations of all sorts. It was one of these paintings, where monsters and godless creatures abound in horrific detail, which young Flaubert saw when visiting the Balbi Palace in Genoa that ignited the inspiration of the writer. This epiphany at the Balbi Palace is essential to understand Flaubert’s book. Just like the painters before him, Flaubert indiscriminately crammed the pages in his book with such heaps of monsters, false saints, lying prophets, temptations, horrors, truths, lies as to render the understanding and the meaning of the text unintelligible. In seven memorable tableaux, Flaubert builds up Anthony’s ordeal. The Saint is badly hallucinating. Visions, temptations and terrors follow each other. Anthony, starved and exhausted, has nothing but his belief to protect him. Starting with tasty visions of perfectly served exquisite dishes, Saint Anthony is in turn tempted by immense treasures of gold and silver, worldly power fit for emperors and carnal pleasures offered by the dazzling Queen of Sheba. A former disciple, Hilarion, turns into a satanic guide and whisks the terrified anchorite through crowds of false idols, untrue divinities, shows shocking heresies, questions mute oracles and blubbers inane priors. The review of false beliefs is as well encompassing Buddha, as Moloch, Zarathustra, Cybelia and even Jesus. The Demon then grabs Anthony in his claws and drags him into space, showing him earth’s and man’s futility in an unending, ever expanding Cosmos. Finally after a tussle between lurid Luxuria and soothing Death, two faces of a same coin, Anthony is overwhelmed by an apocalyptic cosmic vision of that immense diversity of Live. Only the appearance of Jesus face in the flaming disk of the rising sun saves Anthony from collapsing into exhausting madness and ends the seven chapters, 200 pages of hallucinatory indigestion. In his critic, d’Aurevilly, had indeed touched a nerve by comparing the “Temptation” to Faust. 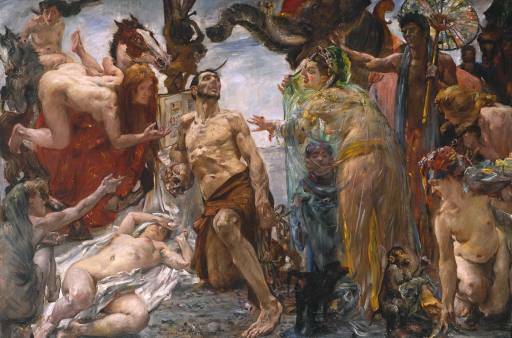 The description of Saint Anthony’s ordeal was for Flaubert, what “Faust” had been for Goethe. Flaubert had worked on his text for more than 30 years, starting at 18 year, with “Smarh”, an early variant à la Faust, rewriting it three times in the course of his life before daring in 1874, at the age of 53, to offer it to the public. During all these years Flaubert kept tinkering with the book. Changing words, sentences, rewriting whole passages, always in pursuit of perfection, reading it to friends, reworking it as he became more adult ,more experienced and…older. His beliefs, his reading show through the lines. Spinoza’s philosophy is softened with Spencerian thoughts and flavored with crude Darwinism. Flaubert in the end taught it his masterwork. When in ’57 he was summoned to court because of the Scandal of his “Madame Bovary”, Flaubert had defiantly claimed that “La Bovary, c’est moi !”But with some hindsight it would have been truer if he had claimed “Saint Antoine, c’est moi! The major attraction of the book is without doubt the language. Flaubert impresses with the demonstration of his skill. He is the real “Word Artist”. Every sentence, no, every word is carefully picked, chosen, held against the light, fitted against the next, the previous. The text is exquisitely chiseled, the work of a goldsmith.There are the sounds, the music of the language. The description of the beauty of the Queen of Sheba and her court for example simply dazzles. The horror of the Christians martyrs awaiting their sacrifice is so awfully depicted it makes you uneasy. André Gide could get emotional about the beautiful sentences, (les belles phrases), the clearness of the text ( la limpidité) but it was the “movement of the soul” which he could detect in the pages which impressed him most. Because of it’s intrinsic qualities, Flaubert’s temptation was not forgotten. Brighter minds picked it up and lauded it. Paul Valery, reminded the public that it was no less than a physiology of Temptation, that Flaubert succeeded to paint. Earlier, it was Huysman’s, who in his “A Rebours” praised the dialogue of the Sphinx and the Griffon in the last chapter of Flaubert’s book. The Modern reader should have less problems with Flaubert’s exuberance. « La Tentation » is a synthesis, an overview of all believes, religions, vices, temptations. Understanding Flaubert’s “Temptation” does not demand a detailed Exegesis, It is unnecessary, useless to explain every detail of the work. It is an existential epiphany, not unlike Eastern mysticism, the mystic dance of Shiva, a cosmic dance mocking all our temptations, and our futile attempts to resist. It is the dance of Live’s energy. very depths of matter--to be matter!"